The Society has recently started a venture called The Chess Valley Landscape Project. The broad aims of the project are to explore and to understand the landscape of the Chess Valley as it has changed over time. This is clearly an ambitious undertaking and requires the involvement of the History side of the Society to locate and interpret existing documentary evidence as well as that of the Archaeological side to investigate, amongst other things, the prehistoric circumstances. 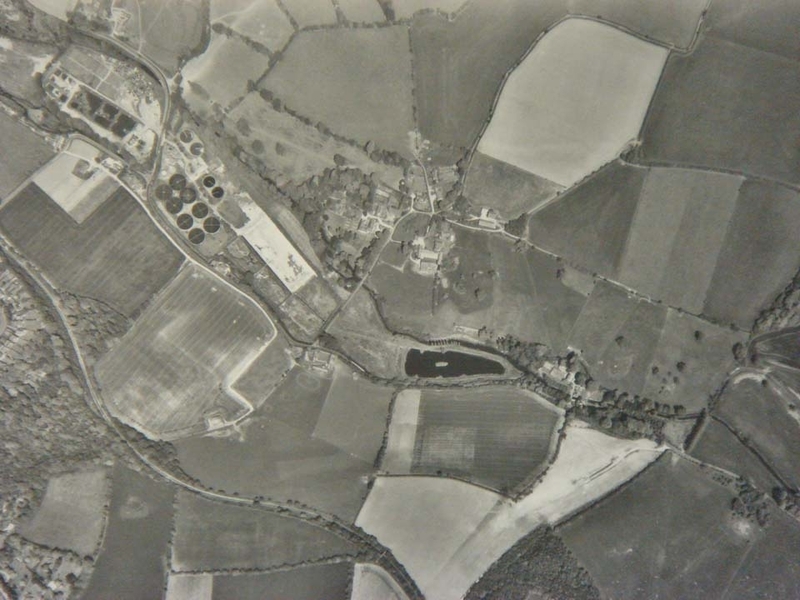 Photographs, including some of the farm buildings and also aerial views. 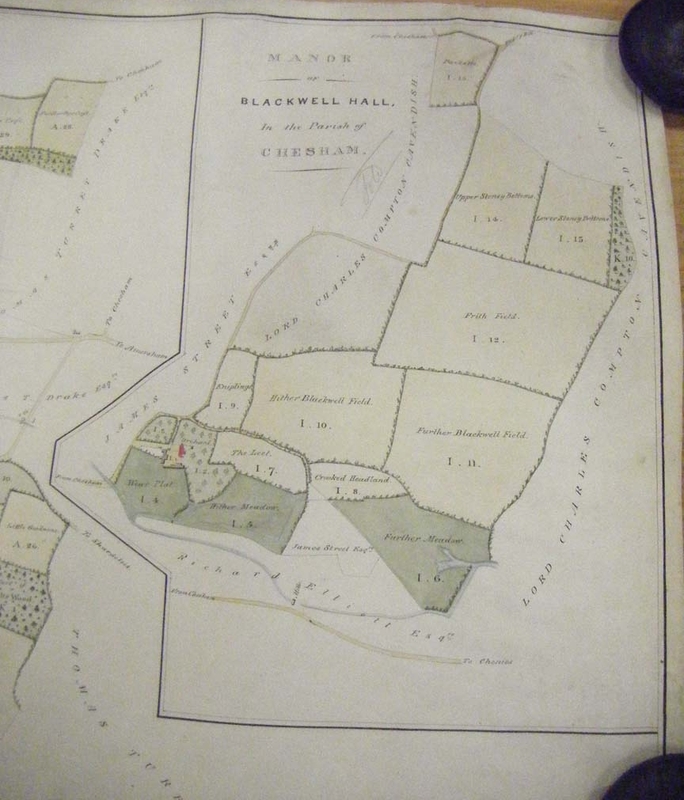 Maps, including Ordnance Survey sheets, tithe maps and the illustrated manorial map of 1837. 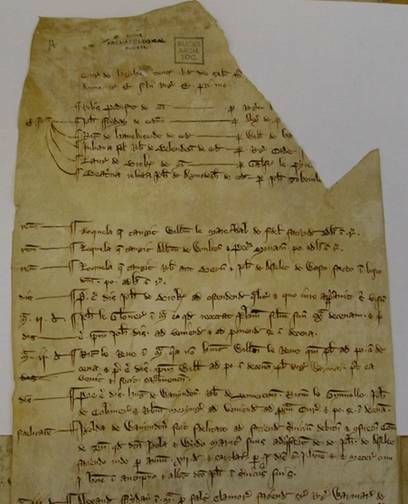 The Manor Court records, which are held at the Centre for Buckinghamshire Studies in Aylesbury, with the earliest dating to the fourteenth century. One of the earlier records is shown here. The Sites and Monuments Records, the locations of which are marked on the accompanying map. 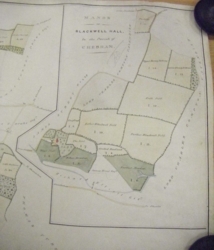 1227 William Blackwell held land in Chesham in 1227, and his name occurs again in 1236-42. 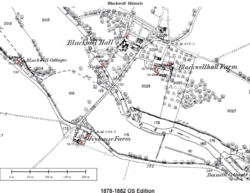 1321 The manor of Blackwell, so called for the first time, had come into the possession of Edmund Earl of Arundel, who settled it on himself for life with reversion to Richard his son. 1328 On the forfeiture of Edmund Earl of Arundel in 1326 the lands escheated to the Crown and were bestowed by Edward III in 1328 on John de Warenne Earl of Surrey in fee simple. The Earls of Surrey afterwards subinfeudated the manor and are mentioned last as overlords in 1430. 1393 The ownership in fee of Blackwell Hall was vested in William Esenden and Alice his wife, who in that year renounced their interest and that of Alice's heirs to Sir Robert Bardolf and Amice his wife, lords of Chesham Bury. 1416 On the death of Amice in 1416 Blackwell Hall was inherited by her grandsons Robert Langford and Walter Daudessey, kt. 1429 Robert Langford appears to have acquired his cousin's interest, as he died seised of the whole manor in 1429, leaving a son and heir Edward Langford, aged three. 1432 Robert Langford's widow Elizabeth married John Boyville and settled Blackwell Hall in 1432 on herself for life with remainder to her issue by her first husband. A remarkably long sequence of documents has survived telling us what happened in Chesham's Manor Courts. They are written in abbreviated form in medieval Latin, so that it is something of a challenge to read them. In addition, they record with some brevity the answers to questions that are not recorded, so that even when we can read them, interpreting what they say presents a further challenge. However, after some practice, we have managed to elicit a certain amount from them, and what they have to say is proving of some help in the Chess Valley Landscape project. 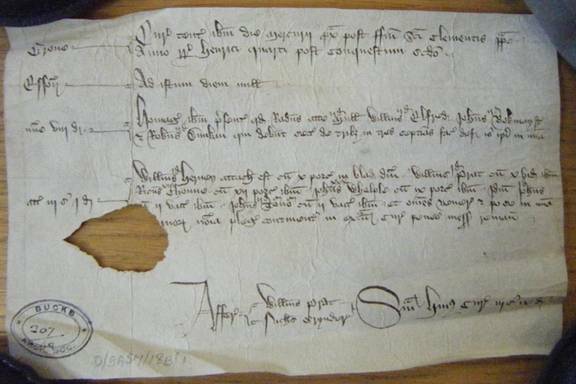 The Records Group has been working on the records of Chesham's Manor Court for some time, and the following sections give some account of what has been done, what is going on at the moment, and what we might do in the future. 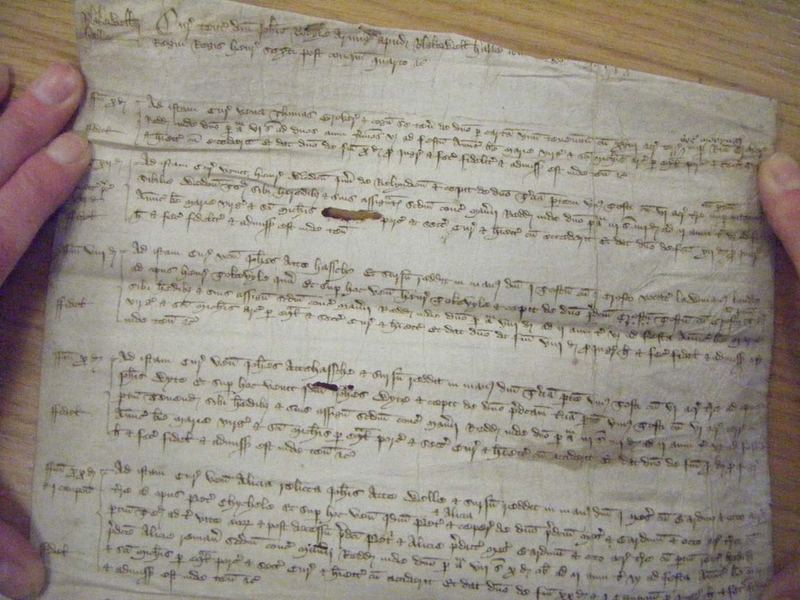 A number of the earliest rolls, which date from the beginning of the reign of Edward II in 1307, have been transcribed, translated and examined to see what they have to tell us about life in Chesham in the fourteenth century. They show, unsurprisingly, a feudal society that was conservative in its habits and much concerned with rural activities. The illustration above, taken from the Luttrell psalter, conveys its essence. But the members of this society also displayed a considerable sense of community, looking after the less-well off, and showing real reluctance to act against fellow members on behalf of authority. 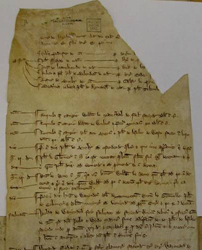 One of the records, held at the Centre for Buckinghamshire Studies in Aylesbury and dating from 1310, is shown below. A smaller number of rolls dating from the early 1350s has also been examined to see what they can show us about the aftermath of the Black Death in Chesham. (The Black Death peaked in the summer of 1349.) The records contain evidence of a much higher number of deaths than normal, and also contain indications that law and order were beginning to break down under the stress of the times. But they also show that, where possible, life carried on much as normal despite the extraordinary circumstances. Both the Grove and Blackwell Hall were manors in their own right, and held Manor Courts, some of the records of which have survived. The Grove was originally part of Chesham's main manor, Chesham Higham, while Blackwell Hall had earlier been part of Chesham Bury. At the beginning of the fourteenth century, the Grove belonged to Walter Langton, one of the most powerful people in the country. Both the Grove and Walter Langton are mentioned in Chesham's Manor Court records, which, in effect, recorded the power struggle that took place between Langton and the Lord of the Manor, the Earl of Oxford. The surviving records for the Grove date from after Langton's death, but they still reveal the Grove as a manor that was far from being the rural backwater that its size and location might suggest. 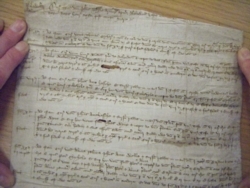 One of the Grove's Manor Court Rolls is shown below. 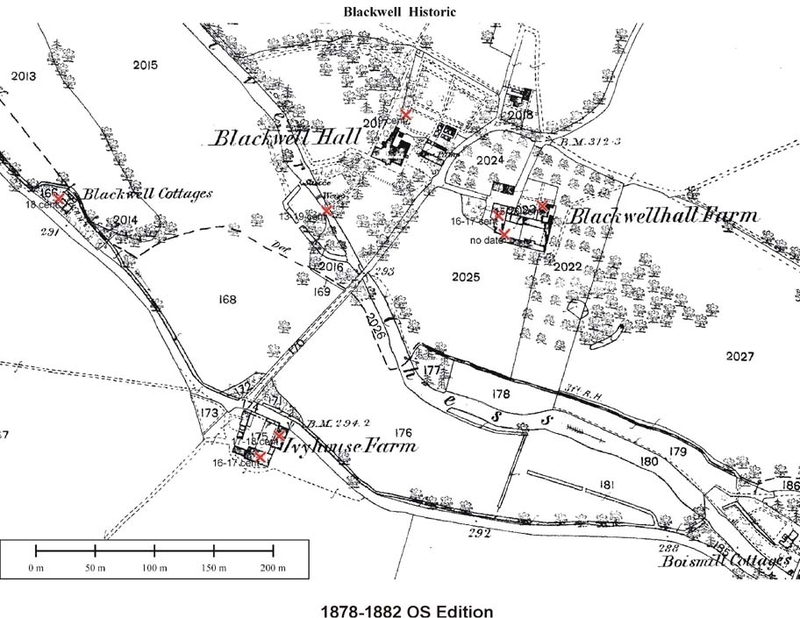 The records of Blackwell Hall's Manor Court reveal that in the fourteenth century it was also rich and prestigious in much the same way as was the Grove. Its subsequent history became extremely complex as it split in two and was involved in various aggregations of manors under different Lords of the Manor. In the period around 1400, however, it does look as if the seats of power in Chesham may have been at the geographical periphery rather than at the centre. During 2009 we made good progress on the above project and were able to publish some of our findings. Two articles have been published in the Society's journal. These are essentially introductions to the Manor Court records and what they contain. 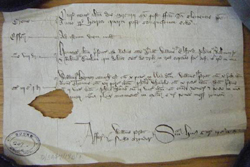 An article has appeared in the Records of Buckinghamshire for 2009 entitled "A glimpse of life in early 14th century Chesham as revealed by its Manor Court rolls". This is based on the court records for the years from 1308 to 1315, and paints a picture of a conservative rural society dominated by feudal procedures. Some years ago, members of the Society transcribed Chesham's eighteenth century Manor Court Records. We had intended to look at them to uncover what they have to say about the Chesham of the time, but other projects have intervened. Copies of the transcriptions are held in Chesham library and at Aylesbury. If anyone is interested in looking at them, do get in touch. It would be a good way to get involved in this engaging field of interest.